Not only is this a fine example of the hexagonal genre but look...it's a prism map as well. Real world 3D hexagonal prisms! Great work! We need more examples of mapping cues from the real world so maybe this will be the start of a new thread in my blog. Next up...let's take a look at some of the fine work by Slartibartfast who as most readers will recall was a designer of planets and whom won a richly deserved award for his Norwegian coastline. Let's hear it for Slarti...the man behind bezier curves. When is an award not an award? Tonight I am embarrassed to be at the British Cartographic Society Symposium in Basingstoke. Each year there are a number of awards conferred on those who submit their professional work for judgement by their peers. I have submitted work on numerous occasions and been fortunate to have received two awards in the past. It's been a source of great pride. This year, my colleague Damien Demaj and I submitted a map to the John C Bartholomew small scale thematic mapping category. I believe something like 6 other individuals or organisations did likewise (though that is unverified). Unfortunately, for some reason or another, BCS, with the support of Collins Bartholomew and the Bartholomews family did not bring themselves to make a decision on a winner in the category they sponsor. The category wasn't even mentioned and no explanation or thanks to those who entered offered. This is both insulting and unprofessional. It is not the winning that matters. In many ways it's irrelevant...but for a sponsor to absolve themselves of the responsibility to decide who, amongst a single crop of entries, is the best in a given year is lame. As Editor of The Cartographic Journal it is my job to ensure the Editorial Board select a winning paper from each issue. This requires people to read and re-read; to compare and contrast; to look for uniqueness, innovation and high quality work. It takes time. Our baseline is that we compare papers to those published within the year. So we select a winner. What we do not do is say we found them lacking compared to last year; or find some other excuse for not making the award. Neither do we hide behind silence. In my view this has seriously devalued the award and, more generally, the awards. Why have awards if the judges cannot make a decision? Let me be absolutely clear...the fact I entered is immaterial. I neither need nor seek praise in this way but I support the awards by entering. What I hope to do here is stick up for all those who did enter and note the dissatisfaction. I am not alone and I have heard comments from many delegates that feel it is a ludicrous situation. The outcome? Hopefully BCS will address their entire approach to their awards; be more transparent; and reserve the right to take sponsor's judgments as merely advisory. Awards have to be made, particularly as there is so much encouragement to enter and so much hype to make them be seen as prestigious. People take a huge risk entering their work and have a right to expect a resolution. I won't be bothering again. I wasted my time, effort and $280 in postage. For that, I expected one of the entries to win. Instead, I congratulate all those who entered and took the risk. I particularly congratulate the winners of those who were awarded in other categories. I am sorry that, for some, it was an entirely pointless effort in the John C Bartholomew category this year. Of course I'll be accused of sour grapes but to me it's about making a stand to get it right in the future. This cannot happen again. One last thought...there was a £500 prize for the winner of the John C Bartholomew category. It would be nice if they donated it to the London Mapping Festival's charity (MapAction) given it wasn't awarded. Last week I crossed off a work-related blog that I'd been meaning to write for a while. It demonstrated how to recreate data binning for point datasets using hexagons in ArcGIS. It's not a new technique but the fact that I told people how to do it in a particular environment has caused some discomfort given the tweets I've had fired at me today. It doesn't take very long to do a quick search online to find examples of the use of hexagons in cartography. Sherif Amer used them for investigating service planning and Danny Dorling used them as a form of cartogram in a range of studies including his analysis of poverty, wealth and place in Britain 1968-2005. Dorling's own work on area cartograms is well known and gives the basis for hexagonal tesselations of space though Waldo Tobler, of course, proposed hexagons as a transformation useful for districting in 1973. Nicholas Lewin-Koh provides a good overview of the technique whose purpose is simply to tesselate space into an aesthetically pleasing grid of polygons of equal size in which to represent some other dataset as a spatial histogram. It's become a reasonably popular technique. Zach Johnston did a good job illustrating the technique at indiemaps.com and provided code to allow others to replicate should they wish. There is also a really nice blog by Nate Smith at MapBox.com on their efforts with this technique that describes the technique for QGIS and Tilemill. Now here's the thing...I don't subscribe to the view that a concept or a technique is the unique preserve of one person or one approach. I like what others have done. I also like that you can do it in ArcGIS but until now no-one had explained the relatively simple process. My job is to provide people with help to enable them to make good maps. How they go about it and what they prefer to use is their choice but by giving people options it supports better cartography more generally. I have no association with the technique (other than knowing Professor Dorling and having met Professor Tobler); no more than any other established cartographic technique I employ or I use. The blog I wrote doesn't imply ownership. It's not a paleo/neo thing...in fact, those who have read my Editorials in The Cartographic Journal over the last 6 years will know where I stand on that distinction. There's room for us all...whether we largely use proprietary software or open source or whether we come from a computer science background or a cartographic background. We all have space to learn from each other and being united in showing people how to make better maps is really what makes me tick. 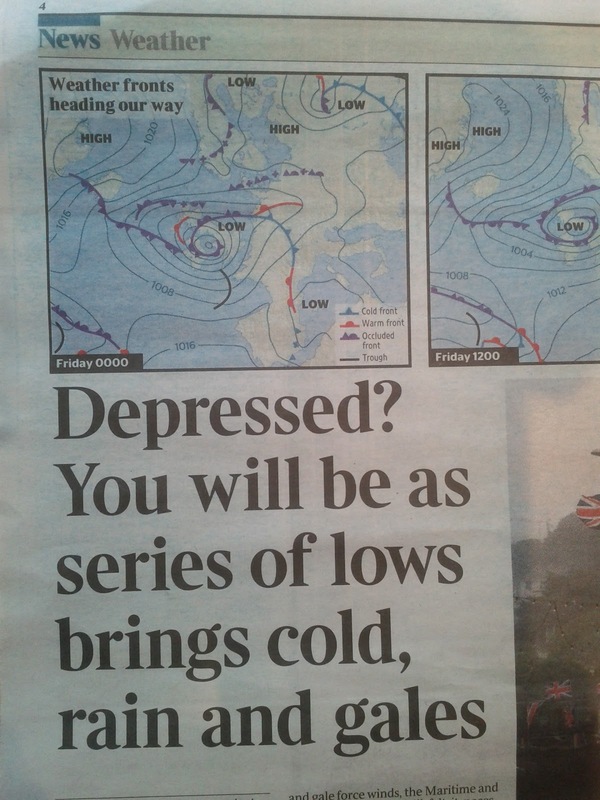 I'm on a brief trip back to the UK and with the current weather being, shall we say, inclement the British press is full speed ahead reporting the latest weather related news. Syria? Spanish bailout? Prime Minister leaving his 8yr old kid at the pub? 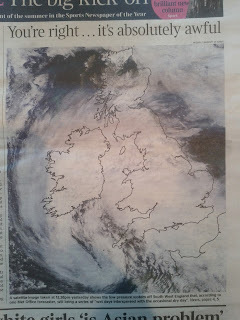 No...there's simply nothing more newsworthy in the UK than the weather. Or is there? Well it's certainly silly season when it comes to the hysteria surrounding Google and Apple's invasive, morally abhorrent attempts to make maps. 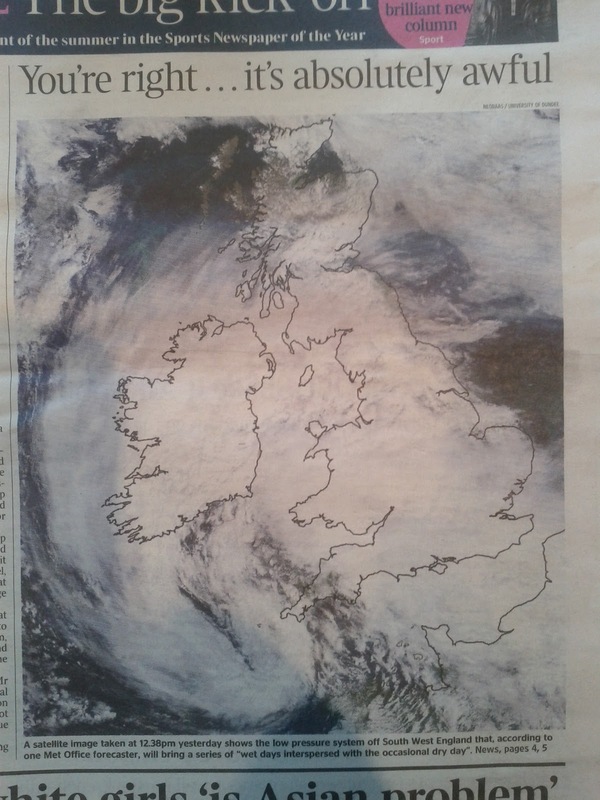 While The Times has been using satellite imagery and weather charts to illustrate their reporting of the weather in Friday's edition (below), The Daily Mail and The Telegraph have been sticking the boot into Apple and their new mapping products. How many of these so-called journalists actually know anything about mapping? Do they understand how maps are made and that the basis of any form of map is data acquisition? The maps they use every day to tell their stories are based on the same sort of survey techniques we've been using for decades. Aerial photography and satellite derived data are not new but like every technology driven industry, techniques improve, companies innovate and we all end up with new stuff. And what about those nice shiny consumer devices they use every day to get from A to B, to set up business lunches, to meet their latest whistle-blower, to eavesdrop on the innocent? Those devices use geo in many of their applications. Journalists use geo in much of what they do and I'd hazard a guess that geo is critical to their jobs. The irony in their scaremongering reports of mapping companies gathering data from which they can make maps and other useful information products is astonishing. The trouble is, cartography has always been something the general public seems blissfully unaware of...maps just exist right? 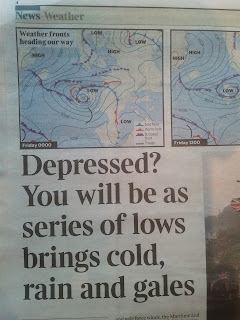 So when these lazy journalists, fresh out of a graduate trainee programme (like Mr Collins, the Telegraph Science correspondent who I suspect couldn't tell his latitude from his longitude), start spouting their ill-informed b*llshit about geo it's worrying. Worrying because the even more ill-informed public lap this sort of drivel up. Apparently, Mr Collin's job is to "keep track of the latest developments and research across all areas of science and present them to the reader in a clear and interesting way". It says nothing in there about jibbering nonsense. I don't mean to pick on this guy in particular...but really, either report things properly and based on facts or stick to reporting the weather. Seriously. Glad I got that off my chest, now then...has it stopped raining?